The last couple years have been full of adventure for me and I wanted a way to capture those adventures and memories forever. Printiki is a photo printing service that can help you do just that. You can print directly from your phone, tablet or desktop and can choose your photos from Instagram, Facebook or your camera roll. I've always been a big fan of collage art with pictures and I wanted to use my pictures as a focal point above my desk. I love sitting down to do some work and looking up to see all of the places I've been. It's like I have a little motivation board right in front of me. "Do your work so you can keep on traveling" is what I keep telling myself. I love, love, love the polaroid option. 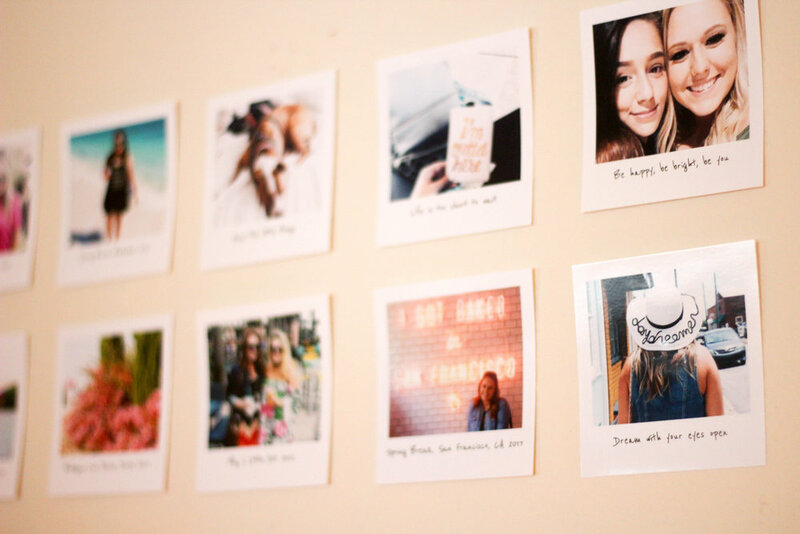 You can choose to write a description underneath your photo, just like an actual polaroid. I'm all about the vintage look. If you're looking for a way to bring your memories to life, Printiki is the way to go! They offer many different styles and sizes of photos and ordering was fast and easy. Use code TXUGR978 to get FREE SHIPPING on your order! Big thanks to Printiki for my complimentary photos! How do you keep your memories alive? Do you use photos to decorate or do you prefer other ways like scrapbooking?